If you are not seeing Recommended Products below your shopping cart, there are two System Settings to check in your site's admin tools. The first is cart.recommended.products.taxonomy.base which should have a value of "PRODUCT_CATEGORIES". The second is recommended.products.displayed.in.cart which should have a value greater than zero. Once you have confirmed or updated these two System Settings, wait for the website cache to clear and check again. 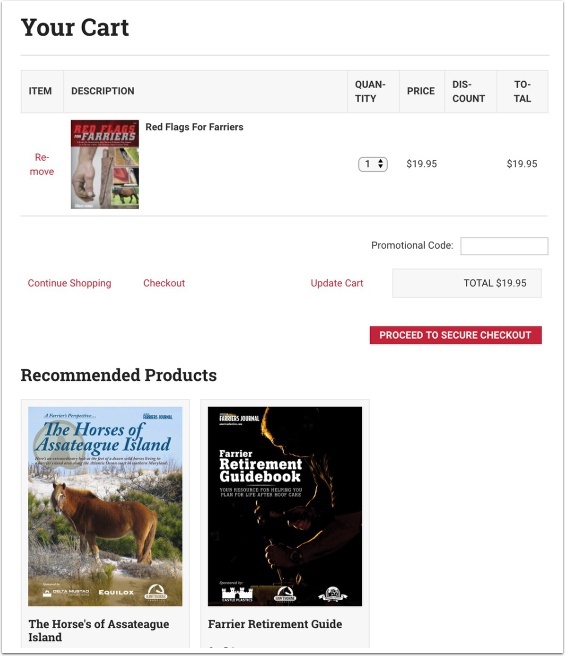 The system will select the number of products as set in recommended.products.displayed.in.cart from the same category as the LAST product added to the shopping cart. The recommended products are displayed in recency order with the newest appearing at the top-left. Products that are currently in the cart should be excluded automatically. If you set recommended.products.displayed.in.cart to a number greater than the number of applicable products in the product category of the last item added to the cart, the system will only show what is available. It is possible for the number of displayed items to be less than the recommended.products.displayed.in.cart setting. Prev: How do I give a user who has purchased a product made up of multiple downloadable files access to those files? Next: How do I create a subscription product?